Ever since the economic meltdown, the news has been peppered with stories about dentists seeing more patients who clench their teeth, grind and brux. According to a Chicago Dental Society poll, “Nearly 75 percent of dentists surveyed said their patients reported increased stress in their lives. And 65 percent of dentists said they have seen an increase in jaw clenching and teeth grinding amongst their patients.” As recovery from the recession appears to be slow-going, it’s no great leap to presume that these habits may become chronic. There are several reasons for concern, not the least of which is the pain that can result – headaches and pain throughout the jaw, face and neck, even into the shoulders and upper back. Chronic clenching and grinding also damage the teeth over time, wearing down the biting surfaces or even chipping the teeth. 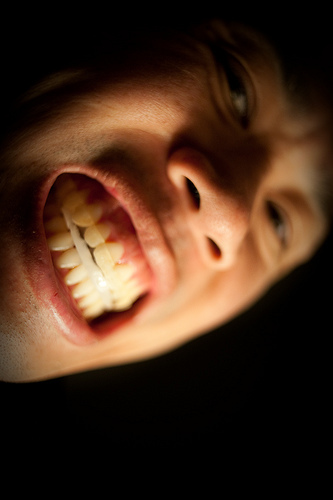 Occulsion – how the teeth come together in a bite – also may be thrown out of alignment, which can further contribute to pain. Moreover, the psychological stress itself may contribute to other dental problems. Research published last year in the International Journal of Dental Hygiene demonstrated that elevated stress increases the levels of inflammatory markers in the gingival crevicular fluid and of cortisol in saliva. Study subjects also had inflamed gums and more dental biofilm (plaque) on their teeth – conditions that pave the way for increased caries (cavities) and gum disease. Compounding these problems are the fact that, as research published in the Journal of Periodontology has shown, more than half of us neglect regular brushing and flossing when stressed. Times like now, when national and global problems can contribute so much to our stress load – problems that we can’t do much about individually – it becomes more important than ever to do what we can to manage our stress and not let it get the best of us. Eating a nutritionally dense diet based on whole foods, including plenty of fruits and vegetables, can minimize inflammation while giving your body the nutrients it needs for good health. Avoid processed foods that are high in sugars and refined carbohydrates, as well as caffeine, which just adds to muscle tension when you’re under stress. Therapeutic massage or other body work can help by both soothing the pain and loosening the muscles, working the tension out of the body. You can even massage your neck and jaw yourself to do this. If you choose to use a therapist, consider finding one who’s qualified to provide craniosacral manipulation, as it can be particularly helpful for releasing tension and easing pain in the face, neck and upper body. Acupuncture can be used for general relaxation or for dealing with pain. In fact, more and more studies are showing the real benefits of acupuncture for reducing pain, including that associated with clenching and grinding, as well as TM joint disorders (TMD). Though many of us flinch at the thought of needles, when performed by a well-trained and qualified acupuncturist, the procedure is not at all painful or uncomfortable. Most people who grind do so at night, so taking supplements to help relax both body and mind can help reduce the amount of nighttime grinding. Magnesium and calcium supplements taken together are wonderful for relaxing the muscles. Valerian root and chamomile are excellent calming herbs. Most bedtime teas include one or the other in addition to other calming herbs such as passionflower, lemon balm, mugwort, St. John’s wort and lavender. Exercise is well-known to reduce stress and anxiety, thanks in part to the release of endorphins: opiate-like neurochemicals that reduce pain and give the sense commonly known as a “runner’s high.” Also, moderate exercise keeps your body – including your immune system – strong and healthy, more resilient to stress. Activities such as yoga and tai chi may be especially helpful in that they combine both mental and physical processes, releasing stress. Taking a mental and physical time-out to slow down, breathe deep and focus beyond immediate problems and stressors can also provide for greater calmness and mindfulness – states that make us better able to deal with stress and problems in our daily lives. Some people choose prayer, while others choose zen-style meditation, and yet others may do guided visualization or any other sort of meditative activity. The key is to find the meditative style that works best for you. Your dentist, of course, can also help. Typically, the first step is to provide you with a molded plastic mouthguard fitted to your teeth to help cushion and absorb the pressure from grinding. Using such a “night guard” – so called because it’s worn during sleep, when most grinding tends to occur – can often reduce the strength and frequency of headaches and other pain resulting from these behaviors. To learn more about this topic and other treatment options, see “Why Your Jaw, Face, Head and Neck Might Hurt – and What We Can Do to Help” at drerwin.com.